There is a growing relationship between the requirements listed above. For example, in order to implement an appropriate level of security, an IT organization may implement encryption. However, the fact that the information flow is encrypted may preclude that IT organization from implementing the optimization techniques that are required to ensure acceptable performance. IT organization need to plan for optimization, security and management in an integrated fashion. 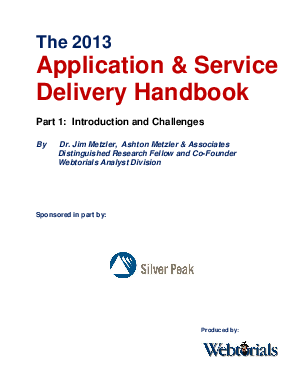 The goal of the 2013 Application and Services Delivery Handbook is to help IT organizations ensure acceptable application and/or service delivery when faced with both the first generation, as well as the emerging second generation of application and service delivery challenges.